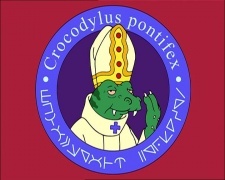 The Space Pope (Latin: Crocodylus pontifex) is the reptilian leader of Space Catholicism, and presumably the replacement of the Pope in the future. First mentioned in "Hell Is Other Robots", he has been mentioned and had cameos in several episodes since. In "The Duh-Vinci Code" it was revealed he resides in Rome and guides ship landings. In "The Silence of the Clamps", he served as the minister to the Donbot's eldest daughter's marriage. In "Meanwhile", he attended Fry and Leela's wedding, at St. Koch's Cathedral. This page was last edited on 9 October 2015, at 07:48.